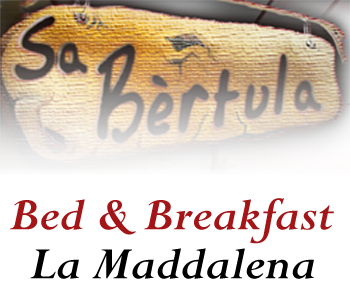 First Bed and Breakfast in La Maddalena Island, born in 2006. The B&B is situated near to the inhabited centre of the island of La Maddalena, in Sardinia, on the first floor of an independent house. The new structure has been transformed in a rustic hamlet with stone, wood in sight and enchanting “murales”. The home furniture has been selected with care using refined and hand made Sardinian furniture. A house composed by natural materials and really near to our enchanting sea. “Sa Bertula” gives us the idea of an ancient world. The guests dispose of two matrimonial rooms and of a double one and both have an independent bath, tv colour and heating. Two rooms have the access into a balcony that looks over a small but rich in plants and flowers garden. The rooms have the names of three islands of the archipelago: La Maddalena, Budelli and Caprera. In the rooms you can admire fabulous hand painted “murales” showing ancient military bunkers, island fishermen, beaches and enchanting landscapes. The bedside tables and the bedheads are very stylish and hand made with wood and iron. The “mangiatoia” or the kitchen is the most distinctive room of the house where you will have abundant and delicious breakfasts. Into the house you find a hand made wine cellar completely realized with wood from an old Sardinian farm (with hand painted pictures finished up with wood, stone and ancient Sardinian tiles), enriched by a perfectly represented masonry arch. The charming setting reminds us the country atmospheres of the ancient Sardinian residences, in which it was possible to eat and also have a pleasant break sipping a good glass of wine. In the rural “mangiatoia” you find also: a bottle containing “acqua vite” (Filu e Ferru) and an ancient handcraft wagon wheel in wood and iron realised in the XIX century.